GREENBURGH, N.Y. (AP) — David Fizdale went to his office one day last week and got right to work as usual. He wrote ideas on a board. Met with other staff in the building. After about 45 minutes, something dawned on him. “I had to, like, stop myself. 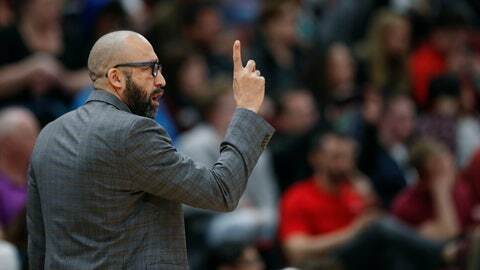 Wait a minute, you don’t have to get it all done right now,” Fizdale said. There’s plenty to do when it comes to fixing the New York Knicks, but it can’t happen yet. So Fizdale convinced himself to go home for some family time, but he’ll be back to work as a coach this week. He expects to get started pouring over film of college players, and of course there will be months of discussions about potential free-agent targets. He was beaten often during the worst season in the NBA, but he certainly doesn’t seem beaten down. A 17-65 finish was tied for the worst in the history of a franchise that has lost plenty for nearly two decades, yet Fizdale said fans have been great to him. Part of that, he figures, is because the Knicks made it clear they would be focusing on growth and development and never pretended they were going to contend this season. The plan this season may ultimately serve the organization but 65 losses stain a coach’s resume. Fizdale, though, had enough success before coming to New York, both as a championship-winning assistant under Erik Spoelstra in Miami and then reaching the postseason in his first head coaching job in Memphis, that he’s able to shake it off as a sacrifice. “I’m not some like steel beam. I’m human and I have my moments of doubting myself obviously and the one thing I’ve learned as I’ve gone through this, been lucky enough to work with some really good coaches and players, is you eliminate doubt through work ethic,” Fizdale said. Nor, he said, will it make him lobby team president Steve Mills and general manager Scott Perry to fast-track the turnaround, to sign players who could help the Knicks get better next season but not stay good much beyond that. He signed on agreeing to a plan he won’t try to alter now. The Knicks were fractured for years, worse at building a culture than winning basketball games while rapidly cycling through coaches, executives and players. But along with Mills and Perry, Fizdale says the organization is proving it now treats people with respect. Part of that, he says, is continuing to work with players on this team full of free agents who may not be back. Mario Hezonja showed up to work out and other players with uncertain futures in New York will remain welcomed, even though it could be months before it’s determined if they’ll be part of the next roster. The chance of a quick turnaround is there. With Patrick Ewing representing them on the podium, the Knicks will share a 14% chance of winning the draft lottery on May 14. Then there are hopes of being able to lure two free agents from a class that could feature Kevin Durant, Kyrie Irving, Kawhi Leonard, Jimmy Butler, Kemba Walker and more. Fizdale believes the same reasons that made him eager to come to New York will make players want to follow.